Remember the sun? It’s not just a myth, as RICHARD POWELL discovers in balmy Bermuda. A tropical paradise in the North Atlantic Ocean, Bermuda is an ideal place to relax and defrost. IN a room that wouldn’t look out of place in an English stately manor, a portrait of a young Queen Elizabeth II hangs high, reigning over all who pass through security at Bermuda’s LF Wade International Airport – a royal welcome for visitors to Britain’s oldest overseas territory. Arriving on the Bermuda Islands or ‘Somers Isles’ is an experience all of its own; the airport’s runway sits seemingly inches above the waves on reclaimed land at the north-east point of the volcanic archipelago, providing a spectacular ocean landing. Upon arrival visitors pass through a time-warped gateway echoing colonial days past, built with cutting-edge engineering, into a giant clubhouse where some of the wealthiest people on the planet live, and play. It’s an easy choice, if you can afford it. The average cost of a house on any of the eight main islands is around a million dollars (US). Closer to Canada than the Caribbean (and just a 90-minute hop from New York’s JFK), Bermuda’s winter-busting climate is kept warm by the Gulf Stream. So, while the US east coast was lashed by Superstorm Sandy, New Yorkers with money to burn were golfing or paddling about in a pool here, taking care to avoid sunstroke. Patches of coastline that do not contain an adjoining jetty cram-packed with luxury yachts are a rarity, though un-spoilt beaches can still be found. Perched on limestone cliffs overlooking its own secluded beach, the family-run The Reefs Spa Hotel provides a relaxed island welcome. It’s located at the opposite end of the ‘mainland’ (Bermuda actually comprises more than 300 islands) from where the airport is situated. The transfer is brief: the entire landmass being just 21 square miles. 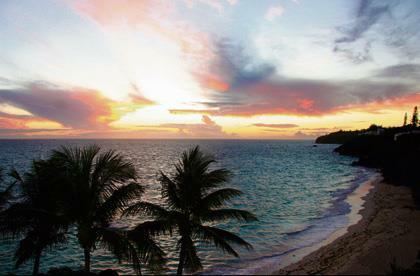 The Reefs offers privacy and outstanding views of the pink-sand coastline. Bermudians take great pride in their unique rose-tinted beaches, which are formed from pulverised corals and mollusc shells. Locals even defied royal protocol and paid tribute to the sands, by rolling out a pink, not red, welcome carpet for the Queen on her last visit. My arrival at the Reefs, while minus the pink carpet, was capped off with a deftly prepared Dark ‘n’ Stormy highball, the national drink of choice, accompanied by a warm sea breeze and ocean views. Home quickly felt like an eternity away. Serving the local catch and imported steaks, the hotel’s Royston’s restaurant (one of three restaurants at the hotel) is a European-style grill house with an open kitchen, allowing diners to watch the chefs do their thing from the comfort of tables… by the fireplace. For a sub-tropical island, fireplaces are a common quirk in restaurants and hotel lobbies, installed for aesthetic purposes only. It’s hard to imagine Bermudians huddling around the fire, rubbing their hands together for warmth on any day of the year. Pampering features highly at The Reefs, and when you’re not letting your afternoons drift by in the cliff-edge infinity pool (a sweet spot at sundown), or swimming in the sea, you’ll be in and out of the hotel’s spa centre taking advantage of some seriously relaxing holistic treatments. From a smorgasbord of head-to-toe elixirs, I opted for a lime and ginger salt glow rubdown. A men’s facial at the Mandarin-operated Elbow Beach Hotel down the road in Paget parish, also proved invigorating and expertly administered in five-star surroundings. Though the island nation remains British, proximity to the US means there are strong connections to both sides of the pond. Local currency is pegged to the US dollar, which can be used interchangeably. And many Bermudians even speak with American accents ­– perhaps gained during periods of study there, as Bermuda has no universities. Bermuda’s visitors are mostly stateside residents and guests coming to enjoy the sub-tropical climate. Famous US residents you might see strolling along The Front in Hamilton could include New York City Mayor (and billionaire) Michael Bloomberg, and actor Michael Douglas with his wife Catherine Zeta-Jones. But many of the island’s wealthiest people are largely anonymous, profiting from its status as a leading global business centre for insurance and offshore financial services. This industry supports Bermuda’s soaring per capita income, which is among the highest in the world. A tight network of exclusive private members’ clubs exists across the islands allowing the high rollers of this sector to interact out of sight, and earshot of the common tourist. One such venue, undoubtedly the most beautiful, and sprawling, is the Bermuda Run Country Club, renowned for its 36-hole international championship golf course. The club represents to the island what the Wentworth estate is to Virginia Water in Surrey; a private oasis within another, supposedly public, island. As the capital of Bermuda since 1815, Hamilton is home to many of the island’s shops, restaurants and almost all of its nightlife (except on Sunday nights, where it’s The Cellar at the Fairmont hotel). Within the town’s centre, the 350-year old Waterlot Inn Restaurant is the jewel. Its steak-tasting trio of Prime Rib Eye, Niman Ranch Filet Mignon and Wagyu Striploin come highly recommended. Hamilton’s seafront promenade offering views across the new harbor is the perfect way to walk off a heavy lunch. The island is a cinch to explore on two wheels. By simply hiring a scooter from a shop by the hotel, soon you will be careering along coastal roads, bathed in a golden glow with the blue expanse of sea and sky at your side: a truly life-affirming experience… even if everyone else seems to have the same idea. It can often seem that there are more mopeds on this small island than there are bicycles in all of Amsterdam. Driving on the left, along narrow roads originally built for horse carts, may not be suited to all visitors, especially for those from the US, or any other country that drives on the right and is used to lanes-a-plenty. Thankfully though, strict island rules on engine sizes mean you’ll never see a Humvee barrelling towards you, guzzling the island’s precious fuel supplies or hogging both lanes on the road. Once you’ve had your fill of scooter excursions, there are many other ways to explore the island’s scenic interior. For more secluded strolls, the island’s disused ‘railway tracks’ offer silent, shady trails. The rails have long been pulled up to leave lush bridleways and footpaths. There is the mile-long path in Paget, which resembles a veritable herbal garden. Dr Kuni Frith-Black, a former Miss Bermuda, can guide you and explain how the vast array of flora that grows in this area can be used to cook all manner of dishes, and cure common ailments. For horse-lovers seeking al fresco action, Spicelands Riding Centre in Warwick provides a scenic hack across the tranquil south shore. The ride passes the picture-postcard Jobson’s Cove and Chaplin Bay, where sparkling waters crash against circles of rocks to form sandy secret gardens. For more experienced riders, to avoid an hour-long plod with newbies, be sure to book a private ride which will give you the opportunity to gallop along the sandbanks. Lovers of the life aquatic will also enjoy the hands-on Dolphin Quest, offering visitors the chance to touch, swim with, and even kiss a dolphin. Swapping the surface of Bermuda for the world beneath, the stunning Crystal Cave – found by chance a hundred years ago by boys searching for a cricket ball – is a must. Descending into the depths, a floating pontoon pathway carries you over deep azure pools to inspect its 30-million-year-old chandelier clusters, hanging majestically at every turn. Back in the built environment, at the northern tip of the tongue-twisting Ireland Island, the Royal Naval Dockyard within a 500-year-old citadel is worth a visit. However, I must admit seeing large parts of this former flagship port’s magnificent stone yards and warehouses in a state of disrepair was a bit sad. The redevelopment of this former colonial trading outpost is a priority for the island authorities and a number of businesses, including craft shops and an arts centre, are already setting up shop. But the nearby Commissioner’s House in Casemate Barracks is the true success story of this neglected area’s painstaking renovation. Fully-restored to its former splendour, the building now houses an elaborate museum allowing visitors to take in the island’s rich history. A must-see inside the museum is the Hall of History by Bermudian artist Graham Foster. The grand mural of the nation covers 1,000 square feet of the basement walls and took the artist three years to complete. Richard Powell is a freelance journalist who also works for the Press Release Distribution, Media Monitoring and Public Relations firm, Presswire, but does not work with or for any of the parties mentioned in this article.